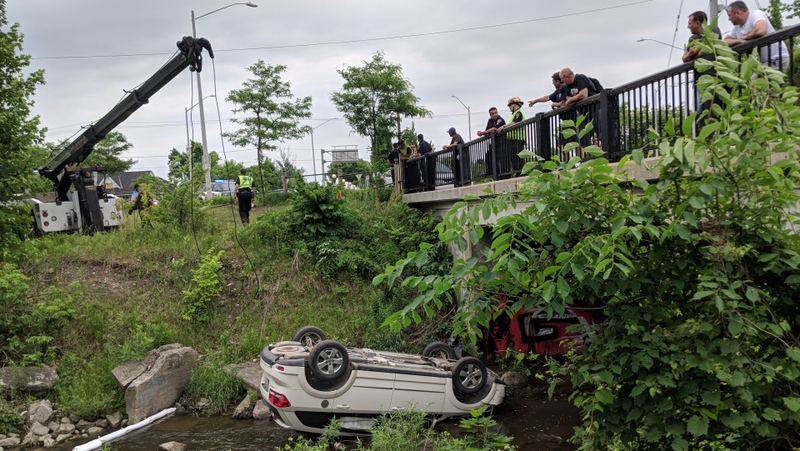 Twice in the last year, cars have mismanaged their way around the roundabout at Lancaster and Bridge streets in Kitchener and landed upside-down and near a body of water. It happened Monday when a car somehow flipped into Laurel Creek. It also happened last September when an SUV ended up along the shore of the Grand River, on the opposite side of the intersection, after colliding with another vehicle. While no serious injuries were reported in either incident, both vehicles were significantly damaged. Both incidents also drew large crowds of onlookers. As Bridge Street runs over the creek on one side of the roundabout and the river on the other side, it has a potential for unusual collisions and mishaps that typically are not seen elsewhere in Kitchener. A temporary orange barricade sits at the corner of the intersection where the SUV entered the river. Steve van De Keere, the Region of Waterloo’s director of transportation, says “large landscaping stones” will eventually provide a more permanent barrier between the roadway and the water. “The probability of a car getting that far away from the road is very low,” he said Tuesday. On the other side of the roundabout, van De Keere says, regional crews will investigate exactly what led to Monday’s incident and whether any reasonable measures could be taken to prevent a repeat occurrence. Van De Keere says drivers should take the intersection “as slow as necessary so they can properly yield to traffic in the roundabout” – typically between 30 and 40 km/h.